The Golden Week gets officially started tomorrow with a national holiday called ‘Showa-no Hi’ that honors the birthday of the previous Japanese emperor posthumously named ‘Showa’ and known as Emperor Hirohito while he was alive. The purpose of the day is to encourage the public to reflect his turbulent 63 years of reign. 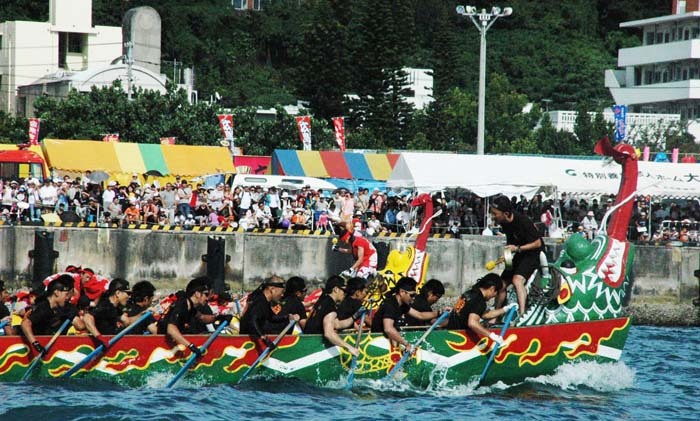 In addition, the Golden Week has a string of three national holidays May 3rd, 4th and 5th, Tuesday through Thursday next week, which on Okinawa are best known as the day of Naha Haarii dragon boat races, and the Naha Haarii Festival at Naha Aja Port. Prior to each race, each crew circles the harbor greeting the spectators. 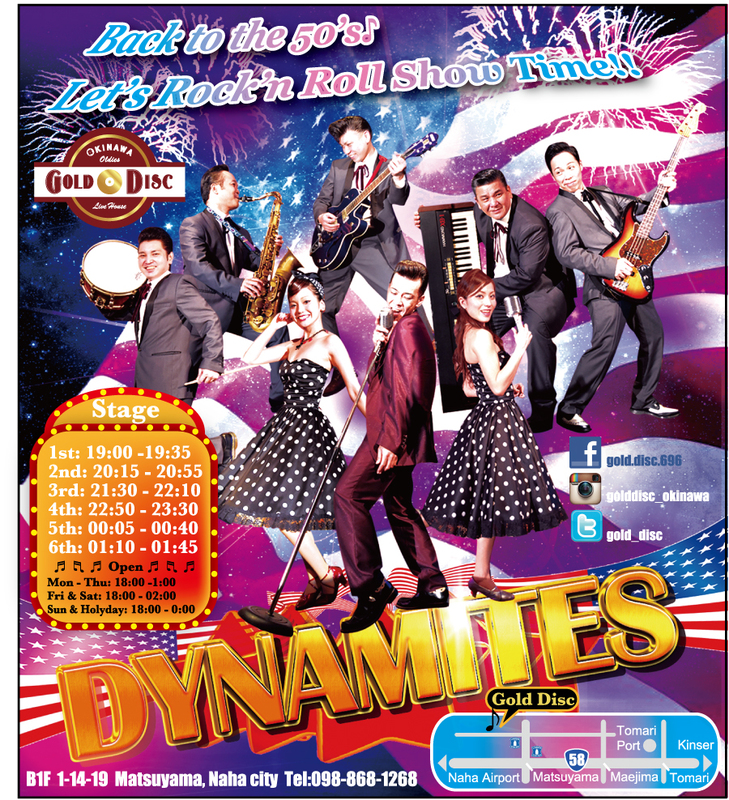 Attending the three-day festival is free, and the action goes on from 10:00 ~ 21:00 every day, including everything from live entertainment to food and drink vendors to souvenir and game stands. 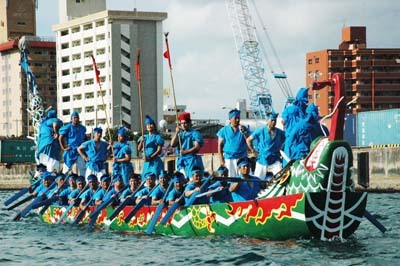 It’s the largest dragon boat event on Okinawa, and the start of the summer-long festival season on Okinawa. Haarii is an Okinawan dragon boat race and festival that celebrates and prays for good catches and safety of the fishermen and seafarers. Traditionally, all Haarii boat races in each areas of Okinawa took place on “yukkanuhi,” May 4th of the lunar calendar, but as tourism has grown, organizers want visitors to watch the Naha Haarii and it is performed during the Golden Week from May 3rd to 5th of the solar calendar. The Naha races take place at Naha Shinko Wharf next to Tomari Bridge, and on the first day, junior high school student teams from Naha City compete against similar student teams from other areas. The races are performed as Buddha’s wish for salvation of the world. The public has a chance to ride on haarii boats on the 4th and the main races are on the last day, May 5th. Besides Haarii boat races, there will be entertainment each day including comedy, live music performances and even a sumo contest for youngsters. Of course, plenty of food, cold beer and soft drinks are available throughout the festival and each of the three days ends with a massive fireworks show. The dragon boat races originated in China from where it came to Okinawa sometime in the 14th century. A legend has it that a Ryukyuan prince saw the “Haryu Ship” races in Nanjing, China, while studying there, and had a copy of the race boat made after coming back to Okinawa. Villages in other parts of the island made their own boats and the races became popular as national events in the Ryukyu Kingdom. The custom was abolished when the Ryukyu Kingdom was made a Japanese Prefecture in 1879. Although the race was temporarily revived the games finally stopped in 1928. The event was again permanently revived after World War II. The biggest difference between Naha Haarii and other races within the prefecture is the size of the boats. Although the crew of the Haarii boat elsewhere consists of about 11 persons, the boats in Naha are larger with crews of up to 40 people. Three boats compete against each other in each heat. The boats race a distance of 400 meters, in four 100-meter round trips. On the final day, teams, representing companies and occupational groups take on each other, including teams from the U.S. military and Self Defense Forces. There is also a race for women teams. Everyone planning to visit the festival is reminded that parking in the area is very limited, so public transportation is strongly encouraged. Maps and festival information are available in computer translated English.